Home › Promotions › The Great Helmet Exchange - April Only! April is Check Your Helmet Month. What a better way to get a new helmet than to trade in your old helmet and $50 off* a new helmet!! 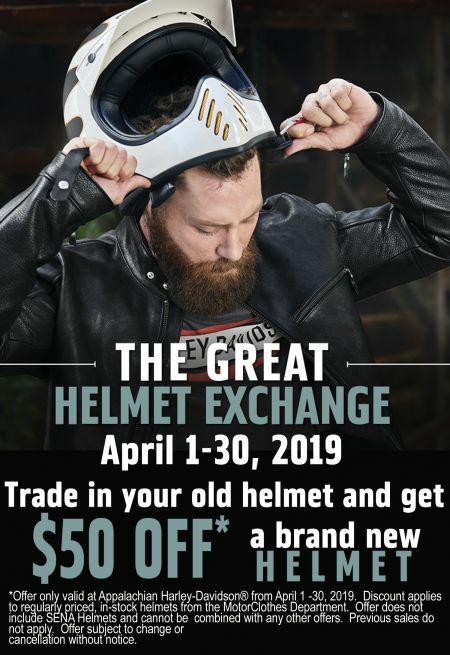 It's the Great Helmet Exchange - April 1, 2019 through April 30, 2019! *Offer only valid at Appalachian Harley-Davidson® from April 1 -30, 2019. Discount applies to regularly priced, in-stock helmets from the MotorClothes Department. Offer does not include SENA Helmets and cannot be combined with any other offers. Previous sales do not apply. Offer subject to change or cancellation without notice.